A paper on historical research presented at a meeting of the Richmond Hill Women's Institute October 12, 1950 by Mrs. L. W. Zuefelt. "The Canadian Richmond Hill has charms peculiar to itself,and is one of the most beautiful villages to be found anywhere throughout the length and breadth of this Canada of ours. As its name indicates it stands on an eminence,and it overlooks a wide expanse of richly cultivated farm land.” Such is the introduction to the chapter on Richmond Hill in the "History of Toronto and County of York" published in 1885. This book is in the Richmond Hill Library. It is situated on Yonge Street about 16 miles from Toronto. Yonge St,is the main thoroughfare with part of the village in Markham Township,and part in Vaughan Township,on Lots 46,47,and 48 Yonge St. in each township. One of the first settlers would seem to have been John R. Stooks on Lots 47 and 48 Vaughan Township,with his home about where Dr. James Langstaff’s home is. 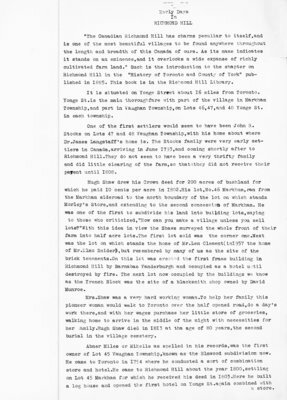 The Stooks family were very early settlers in Canada, arriving in June 1793,and coming shortly after to Richmond Hill.They do not seem to have been a very thrifty family and did little clearing of the farm,so that they did not receive their payent until 1808. Hugh Shaw drew his Crown deed for 200 acres of bush land for which he paid 10 cents per acre in 1802. His lot,No.46 Markham,ran from the Markham sideroad to the north boundary of the lot on which stands Morley's Store,and extending to the second concession of Markham. He was one of the first to subdivide his land into building lots,saying to those who criticized, "How can you make a village unless you sell lots? With this idea in view the Shaws surveyed the whole front of their farm into half acre lots.The first lot sold was the corner one. Next was the lot on which stands the home of Mr.Len Clement (in 1957 the home of Mr. Elmo Snider), but remembered by many of us as the site of the brick tenements. On this lot was erected the first frame building in Richmond Hill by Barnabas Vanderburgh and occupied as a hotel until destroyed by fire. The next lot now occupied by the buildings we know as the.Trench Block was the site of a blacksmith shop owned by David Munroe. Mrs.Shaw was a very hard working woman. To help her family this pioneer woman would walk to Toronto over the half opened road,do a day's work there,and with her wages purchase her little store of groceries, walking home to arrive in the middle of the night with necessities for her family. Hugh Shaw died in I813 at the age of 80 years,the second burial in the village cemetery. Abner Miles or Mihells as spelled in his records,was the first owner of Lot 45 Vaughan Township known as the Elmwood subdivision now. He came to Toronto in 1764 where he conducted a sort of combination store and hotel. He came to Richmond Hill about the year 1800, settling on Lot 45 Markham for which he received his deed in 1803.Here he built a log house and opened the first hotel on Yonge St.again combined with a store. Abner Miles also ran an ashery on the farm across the road. He died in 1806,to be the first white person buried in Richmnod Hill Cemetery. He and his son James also were the first owners of Lot 46 Vaughan Township. Lot 47 Markham,comprising the centre of our village,from the north boundary of the lot on which Morley’s Store stands to the point on Yonge Street where Mill Street,if it were extended would make contact,was owned by Col.S.Wilmot, a United ümpire loyalist. He was a surveyor,and his assistants consisted of forty or fifty Indians who would camp around the village. His house,of the usual logs,stood back of the present Masonic Hall in the middle of what was then a cedar swamp? Colonel David Bridgeford was the early owner of Lot 47 Vaughan. He came to Richmond Hill district in 1799 by ox cart with his mother and step-father,the first Robert Marsh. He served in the war of I8I2 with the 3rd Regiment of the York Militia. He again came to the front in 1837, when he rode with Colonel Moodie to warn the authorities in Toronto of the coming of the insurgents from the north,resulting in the battle of Montgomery's Tavern. He built one of the earliest and the largest buildings in the village in those days. It was built of logs,two storeys high and stood somewhere between Centre and Richmond Sts.near Yonge St. It was the first hotel in Richmond Hill proper. This was run successfully for many years,the beverages being supplied by Mr.Quetton St.George a French refugee. The hotel later was sold with the front fifty acres of bat. 47 to Mr.Gregory who painted it red. Here was the first Richmond Hill Panning Mill Co.,and here too Patterson Brothers began their manufacture of agricultural implements,later moving to what became the village of Patterson. The little street running from the west end of Centre to Richmond was named after Colomel Bridgeford. Lot 48 Markham was first owned by Chevalier Augustus Bointon, a Lieut.-Qolonel on the side of Royalty during the French Revolution, and as a result a refugee in Canada.These refugees were granted land amounting to millions of acres,and many of them settled north of Richmnod Hill.in what was then known as Oak Ridges. This Lot 48 was patented in 1807. The French emigfes did little settlement duties,but after building their log shanties,spent most of their time in York, being well supplied with money.After the restoration most of them returned to France either giving away their Arms or abandoning them. On this Lot are the Mills and Bedford Park Greenhouses. Colonel Moodie was one of the early owners of Lot 49, a military gentleman whose name goes down on the pages of history. He was a half-pay officer in the regular army and had fought in the Peninsula War and the War of I8I2-I5. In 1837,observing that large numbers of strangers were passing south,he volunteered to carry the news to York. He was killed on this mission. In front of his house there stood a huge flag pole on which the Union Jack was always flown on every National holiday. His house was later moved to the corner of Lot 48 where it still stands, the residence of Mr. and Mrs. Wesley Middleton. N. Yonge St. This house was built in 1820 by Dr. Asa Reid. Mr. James Miles,son of Mr. Abner Miles was as mentioned, the first owner of Lot 46 Vaughan. He received some 2,000 acres of land in various parts of Ontario from his father. He never sold an acre,dividing it among relatives,and donating land for public purposes. The sites of the Presbyterian Church and Manse,the cemetery and the public school were all gifts from James Miles. Before the village was large enough to support a Churgh,the Squire organized a Sunday.School where along with religious instruction,the rudiments of reading,writing and arithmetic were taught, and corporal punishment frequently administered. He frequently presented Bibles and Testaments to young people,and with each copy a pocket handkerchief also. This Sunday School was established in I8II and it is a question whether it or one in Gananoque was the first in Canada. Mr. Miles was a liberal contributor to the building of the first Presbyterian Church completed in I821, built by all and used by all denominations in the village. In 1826 he helped organize the Richmond Hill branch of the British and Foreign Bible Society,funds from which were to purchase bibles and testaments in the Indian Language. Funds for the first year were £15 5s. Od. The settlement was first named Miles Hill, Mr. Abner Miles and his son James being the largest landowners and their residences being most conspicuous near the Maple Side Road. Later it was also called Mount Pleasant. In reference to the giving of the name Richmond Hill, it is said that in I8I9 it was decided to erect a Presbyterian Church,and while the work of construction was in progress, a very distinguished visitor, Charles Gordon Lennox, fourth Duke of Richmond, Governor-General of Canada, stopped here with his retinue to rest and feed their horses. The Governor inspected the Church and chatted with the workmen.The people of the village renamed the place Richmond Hill in his honour. This visit occurred in July I8I9 and the Governor died on August 28,1819 on the banks of the Goodwood River,County of Carleton from Hydrophobia. Mr. William Harrison who wrote a series of letters on Richmond Hill for The Liberal in 1889 stated that he had not been able to find among the residents of Richmond Hill still living when he wrote his articles any recollection.of the village having had the honour of a visit from the Duke of Richmond. Another story was that Mr.Benjamin Barnard,the first school master and Notary public who was particularly fond of the song "The Lass of Richmnod Hill" suggested the name Richmond Hill. The first agitation toward incorporation was made in 1853, but the village did not have the necessary 1,000 inhabitants. In 1857 another attempt was made but failed because the northern boundary was setbas north of Elgin Mills,talcing in more territory than the law permitted. The next attempt was made in 1872 and granted by the County Council in June 1872. The first election was.held in.January 1873 with Abraham Law, Esq. being chosen reeve and Kessrs. Warren,Powell, Hopkins and Brillinger as councillors. The most important business transacted in the year І874 was the receiving of the village's share of the township's assets and the share of the Municipal Loan Fund from the Ontario Government. The first was a portion of the Clergy Reserves,allotted in years past. Markham had spent theirs in roads,but Vaughan had invested theirs with the interest being used for schools. Richmond Hill received as their share |l,450 which was paid in debentures and cash. This money was invested in securities, for educational purposes, part of the interest of which lessened the school rate annually, and part was used for village purposes. Later this money was used to provide "An excellent set of appliances for fire protection and a beautiful lot for park purposes". School education began in I8I0 in a log house forty feet long by 20 feet wide with earthen floor and pine blocks for seats. It had six bare windows and one door,and the desks were nailed to the outside walls. It was heated by a box stove. Books were few and were passed from scholar to scholar until each had done his share of the lesson. With the aid of a Legislative grant in I816 a new school house of hewed logs was raised by "public Bees" and did duty for nearly forty years. Built on land donated by Mr. James Miles it served as school six days a week. On Sundays the Presbyterians used it in the morning and the Methodists in the afternoon. It also served as a Town Hall. Mr.Benjamin Barnard became the first school master paid by the Public the magnificent salary of twelve dollars per quarter,and board around - two weeks with a.family. He was his own truant officer and every time a pupil was absent,shortly after 4 o'clock he appeared at the home to know the reason why. Of hotels Richmond Hill in early days had its share. Quoting from Mr.Harrison's articles he says,"If there is no place like home, a good hotel is next best,and were it not for the deliterious articles sold there,they would be safe as well as attractive.resorts to the man business and "the man of leisure”. As Yonge Street became traveled the need for hotels became evident. As mentioned the first public house was opened by Mr. Abner Miles in 1802. The next was built by Colonel Bridgeford and frequented by military men. Another was built where the brick tenement stood. There boarded the men employed in constructing Yonge Street,and according to Mr.Harrison,"The drinking and the fighting were something extraordinary”. This hotel was burned in I87I. The first building erected on the site of the Greenholme Apartments was the third hotel,built in I8II by John Clark who also ran a distillery on Lot 43 Vaughan. This building stood for some seventy years when it was removed to make way for the Palmer House which is now Green home Apartments. Where the stables stood was erected the Lome block on the north-west comer of Arnold and Yonge Streets. Another well-known hotel was Dolby’s which stood where later the Dominion House,now Mr. W. Neal’s showroom was. It was a long,low frame building with stables at the north end. Here the aristocracy of Toronto stopped. It was also the stopping place for the coach which journeyed between Toronto and Holland Landing once a week. On this hotel hung a huge sign with the life-sized portrait of a young woman,called "The Lass of Richmond Hill”. Other hotels ware the Grand Central and the Robin Hood. The first Post Office was opened in Richmond Hill on January 6, 1836. It was in a store where the lawn of the Greenholme Apartments now is. The first mail arriving by the stage coach consisted of eight letters. The Postmaster was James Sinclair. The first Yonge Street Methodist circuit was reported in 1805 and consisted of the townships of York, Etobicoke, Scarboro, Markham, Vaughan, King, Whitchurch and the Gwillimburys. The first meeting place in Richmond Hill was the log. school house. In 1847 the first Methodist Church was built standing about where Brathwaite’s hardware store is.It was destroyed by fire on Sunday,December 21, 1879,just after the congregation had left the service. Mr. Abraham Law deeded the present site at the comer of Yonge and Centre Streets for a new Church which was built at a cost of $17,000,and dedicated on May 20, I881. At that time Richmond Hill,Maple, Wesley, Patterson and Bethel formed the circuit.A financial statement in the possession of Miss Gertrude Grant shows the receipts for the year I881 to be $1,659.19. Mr. С.H.Sanderson has in his possession the letter from Queen Victoria authorizing one of his ancestors to organize a Methodist Church in Richmond Hill. Reverend Mr.Jenkins pioneered the work of the Presbyterian Church in Richmond Hill and York County, coming to the district in I8I8. His first sermon was delivered in Markham from the stump of a tree. He conducted the first Communion service in Richmond Hill in a large pine grove on the site of the cemetery and in which all denominations took part. His stipend not being very large,he took up two hundred acres of land near Carol ,to eke out a living for his family of eleven. He became known as the marrying parson,uniting 843 couples in matrimony between the years I8I9 and 1840. His field of labour reached from Kingston to Niagara and from Lake Ontario to Lake Simcoe. Services were held first in the schooljthen in a large frame Church opened in I821. The brick manse was built in 1876 and in 1880 the present Church was started. The total cost of the building was reported as $6,366 an amazingly low sum. The first Anglican Church was known as Dr. Duncombe's Church, a brick Church he built himself, just north of Mr.Ed. Leno’s home. (In 1957 the Supertest Station on Markham Rd). He got the collection for keeping on the fires, etc. The minister lived in the Rectory in Thornhill and had the Clergy Reserve Fund of about $400 a year. This Church was bu- rned and a new Church built on the brow of the hill on the west side of the road in 1872. The land was donated by John Arnold,who owned the property, Lot 46 Yaughan at that time. His wife chose St.Marys as its name. At present Ihave little information on St.Mary's Roman Catholic Church, other than that the first Church was on the north side of Mill Street on the lot on which Mr.and Mrs.C.Harding are building and that on which the residence of ir. Moriarity stands. A PAPER ON HISTORICAL RESEARCH PRESENTED AT A MEETING OP THE RICHMOND HILL WOMEN'S INSTITUTE OCTOBER 12,1950 BY MRS. L.W. ZUEFELT.